As the fourth Alan Moore graphic novel that I've read, he's nearly caught up with Jeff Lemire (and I still want to read Swamp Thing, and possibly Batman: The Killing Joke, so perhaps Moore will take the lead after all). I'm still a bigger fan of Lemire, and I still think that Moore is somewhat overrated, but I have to give the man credit for his creativity and intelligence. 1. If society looks down upon prostitutes today, imagine how Victorian England must have felt. Perhaps this was Moore's way of suggesting that the upright morality was all a facade. This theory is bolstered by the identity of Moore's Jack the Ripper, who belonged not in the bowels of society, but the upper crust (I'm sure I'm mixing metaphors here, but I'm not a professional-- cut me some slack). Could it mean that Moore is suggesting that middle and upper society is at best no better than the lower classes, and at worst, even more depraved? 2. There's something terribly morbid about our fascination with such individuals as Jack the Ripper and their crimes. Some might even call our interest in them gratuitous. So, in a Catch-22 sort of situation, maybe Moore was being gratuitous on purpose: to mock our interest by taking it to such an extreme. Then, if it has a purpose, it's no longer gratuitous, is it? 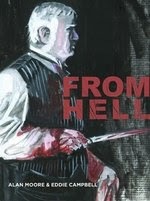 From Hell is a bit confusing at times, with a myriad of characters (none of whom are drawn particularly well), locations, and conspiracy theories to keep track of, and challenging, with occasionally jarring scenes of supernatural elements (including glimpses of the future). For my money, I'll take challenging, but confusing I'll pass on. I also found the lettering scrawly and hard to read. I've scoffed at publishers before for having entire pages dedicated about the typeset used in their novels, asking, "who cares?" When it's bad, I do.